Clouds play a vital role in the formation and detection of the upcoming weather condition. Take for example dry slot clouds. What weather system does this cloud bring? How are they formed? You may have more questions in your mind, so read further. Dry slot clouds pertain to the region of clear and dry air pulled into the spinning clouds that wrap around a developing low pressure system. It is best seen on satellite images and usually marks the beginning of a comma cloud system which is associated with large and powerful low pressure systems. 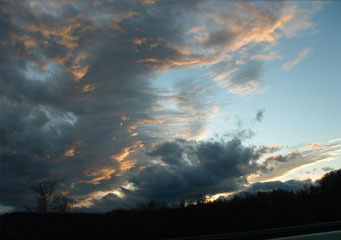 Dry slot clouds develop when a very dry flow of air descends into a lower atmospheric level near the potentially destructive low pressure system. At What Height are Dry Slot Clouds Found? A dry slot cloud is a typical feature of a well-defined middle latitude storm found anywhere between 6,500 feet and 18,000 feet from the Earth’s surface. This is the area where unstable air is extremely strong. On infrared images, dry slot clouds can be distinguished as the cloud-free area or low-level clouds marking the rapidly subsiding upper level air. What do Dry Slot Clouds Looks Like? For a clear recognition of this cloud feature, water vapor imagery must be used. Under water vapor imagery, dry slot clouds appear as long, constricted and trench-like pattern of dark region wrapped around the center of a low pressure system. Moreover, the degree of darkening a dry slot cloud exhibits under water vapor imagery indicates the speed of the thunderstorm development. When viewed by the naked eye, on the other hand, there is actually little or no cloud at all on the dry slot area due to very low relative humidity. How are Dry Slot Clouds Formed? A dry slot cloud forms as a result of rapidly subsiding upper level air and drawn into the swiftly developing low pressure system. This happens when dry air near the tropopause breaks or folds and moves downwards on the rear side of the developing low pressure and caught up in the circulation of developing low pressure system. The intrusion of dry air on low-level moisture produces possible instability which is visible as convective clouds. How common are Dry Slot Clouds? Dry slot clouds are common in areas where mid-latitude storms frequently develop. In the U.S, dry slot clouds are common on the southern part of the country east of the Rocky Mountains during winter season. Storm systems, hence, often develop on the western part of Oklahoma. However, storm systems rarely build up on the southern part of the US during summer. Instead, storm systems often originate on the northern part, near the border between US and Canada. Therefore, dry slots are common in these areas during the summer season. Dry slot clouds are significant indicators that a low pressure system is rapidly developing. These dry slots don’t really last long in one region. Within a few hours, the dry slot will cloud up and the temperature gets a bit cooler.